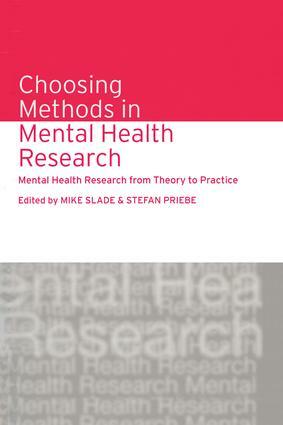 Choosing Methods in Mental Health Research develops a new framework for mental health research. It is concerned with how to choose the most appropriate mental health research method, not only to address a specific question, but to maximize the potential impact on shaping mental health care. Mike Slade and Stefan Priebe focus attention on the types of audience that the researcher is seeking to influence, the types of evidence each audience accepts as valid, and the relative strengths and limitations of each type of methodology. A range of research methodologies are described and critically appraised, and the use of evidence by different groups is discussed. This produces some important findings about the interplay between research production and consumption, and highlights directions for future mental health research theory and practice. The findings presented here will be relevant to mental health service users and professionals who use research evidence to inform decision-making. It will also prove an invaluable resource for students and researchers in the field of mental health.